During your visit to the capital of Spain do not miss the opportunity to get inside one of the most memorable royal castles in Europe. 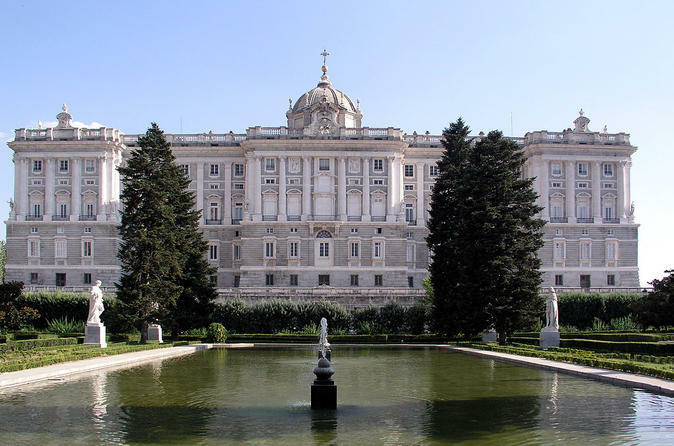 Your professional local guide will help you explore the “Royal Palace of Madrid," in this shared, 2-hour walking tour. There is a maximum of 15 people per booking, but your overall tour group could include up to 30. Starting from Plaza de Isabel II, kick off your walking tour of the Royal Palace of Madrid with your professional local guide and your tour group. The Royal Palace of Madrid used to be the official residence of the Spanish royal family. Nowadays, the palace is also used exclusively for receptions, ceremonies and official events. The Royal Palace is also called Palacio de Oriente due to its close proximity to the “Plaza de Oriente” square, which is on the east (Oriental) side of the palace. Official Lounges: Grandiose, well-preserved and stylish, each room has its own personality. Royal Armouries: Armors, shields and weapons of all kinds are one of the most important collections in the world. Royal Pharmacy: Hundreds of bottles of different shapes and sizes that will make you go back in time. It houses the best recreation laboratory. Additionally, you see the grounds of Campo del Moro, which were not gardened before because it was impossible to connect with the Royal Palace, located on much higher ground. The tour wraps up inside the Royal Palace. Although the tour last about 2 hours, you can choose to stay longer and explore on your own. © 2019 Hello Madrid - All Rights Reserved.